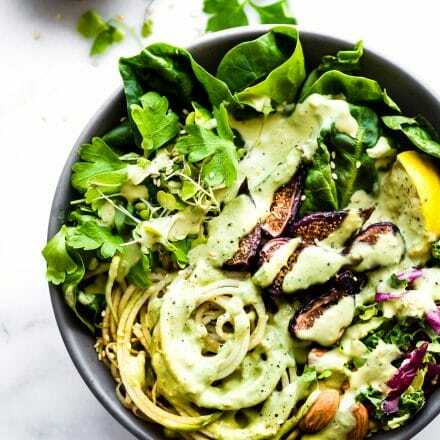 Green Goddess Fig Nourish Bowls – These plant powered nourish bowls are packed with super greens, healthy fats, nature’s candy (Fruit and Figs), and topped with homemade green goddess dressing. They will fill you up and nourish you all at once. Paleo, Vegan, and Whole 30 friendly! 3/4 cup to 1 c Sun-Maid California Mission Figs. Sliced in half. handful of Fresh Parsley (2 tbsp – 3 tbsp per bowl). Extra if you making the homemade green goddess dressing. First make your Vegan Green Goddess Dressing . Ingredient list in notes. If you don’t have tahini, you can use avocado. Next spiralize or thinly slice your apple. Clean and dry the rest of your greens. Shred/chop extra if you bought larger spinach leaves and cabbage. Slice your figs in half. Divide the sprouts, parsley, and apple and place around the spinach/cabbage in each bowl. Add divide figs in 2-3 portions. Place on top of each bowl along with the almonds and seeds. Drizzle your dressing on top of each bowl. Slice lemon, add a wedge to each salad so you can squeeze fresh juice if desired. Drizzle with balsamic vinegar, if desired. I used Sun-Maid California Mission Figs . They are available at most super markets and are DELISH! You can use other vegan green goddess dressing if desired but my Vegan Homemade Green Goddess Dressing is quick to make. Nutrition shown per bowl for 2 bowls (without dressing). Add additional 110 calories for 2 tbsp homemade green goddess dressing per bowl.